Skirting the visible landmark, the Pinnacle Peak Trail is an in-and-out trail offering fantastic views of the northern valley. Trail Description The Pinnacle Peak Trail offers a very rewarding experience through its well maintained paths and panoramic views. You start off at one of the best trailheads around, ascending with smaller switchbacks. Just past the 0.5 mile marker, the Grandview rest stop offers grand views of the valley and McDowell Mountains. 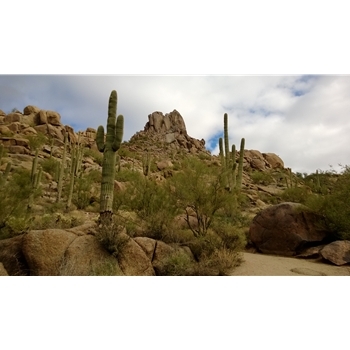 Continuing another 0.5 miles (passing the highest pass at 0.75 mile mark), the Owls Rest opens up to the south-west offering views of the central Phoenix preserves like the Camelback Mountain. Beyond this maintained lookout, a series of switchbacks takes you down the valley and up another crest. Opening up to a nice overview of Estancia Golf Club and luxury homes, from the 1.25 to the 1.75 mile markers, you will take a fast switchback descent to the trails end. Turning around for a same route return, this first climb is the most demanding of the whole hike.